New England head coach Eddie Jones says players will be selected for his Six Nations squad "because they express themselves". Jones, who will name his Elite Player Squad on Wednesday, said: "You have to be able to increase the tempo of the game. "The old days where you could just strangulate teams [are gone]." England begin their Six Nations campaign against Scotland on 6 February. Australian Jones, who was appointed in November after Stuart Lancaster was sacked following England's group-stage exit from the World Cup, said any players overlooked for the squad could have no complaints. "I accept that there will be criticism of the squad, [but] the player that hasn't been selected hasn't done well enough, it's as simple as that," he said. "The players select themselves because they express themselves in a way that I can see them being a profitable part of a winning England team." While Jones's stated aim is for England to be "the most dominant team in the world", he admits they must understand the "meat and potatoes" of the game first. "We've got to get the basics of the game right," he added. 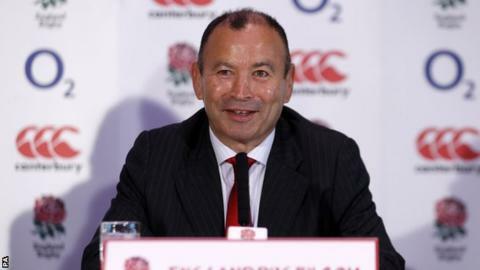 Jones also confirmed that he will act as England's attack coach during the Six Nations, saying his back-room appointments are "all done and dusted" - putting an end to speculation that Northampton's Alex King could join the set-up.